But, there’s bad news, too. Thanks to the kind folks at Jumpshot (whose clickstream data covers tens of billions of Google searches each month on millions of US mobile and desktop devices), we’ve got a fresh look at how clickthrough rates are evolving. The story is… well, let’s just say it’s rosy if you’re a Google shareholder or a PPC specialist. We’ll start in desktop, where Jumpshot’s panel shows us how organic vs. paid CTRs have evolved the last two and a half years. The picture gets a lot bleaker when we switch to mobile. 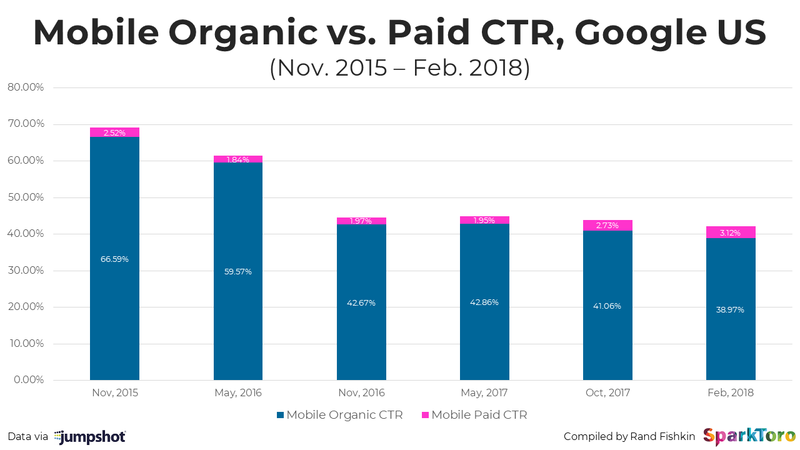 What stands out is how far they’ve come with paid CTR — mobile is only lagging desktop by a bit there (3.12% vs. 3.82% in February 2018). In the organic results, 39% vs. 66% is a huge difference, and the steepness of the drop from a year or two ago is massive. It’s hard to say for sure, but the total SEO opportunity for mobile (i.e. the amount of visits available) may actually be falling (because growth in queries isn’t making up for the drop in CTR). The last bit of data I have helps to complete the picture. This looks at the percent of queries that resulted in no clicks at all. 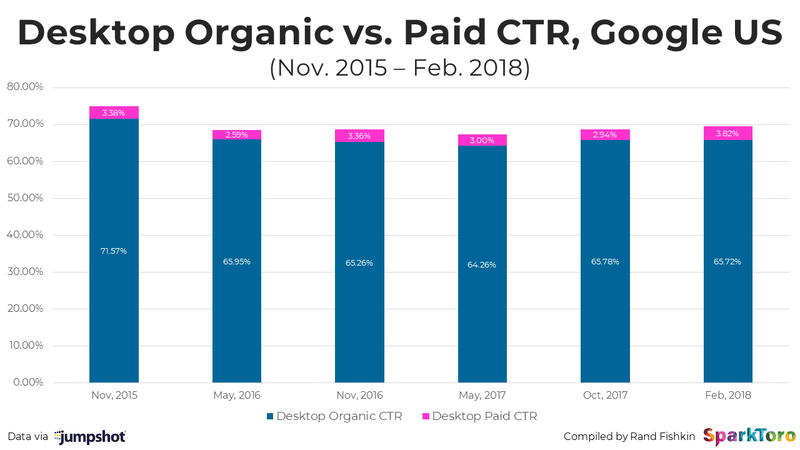 I didn’t directly include it in the same chart as organic and paid CTR because they’ll add up to more than 100% (because a searcher can click more than one result per query, and many do). The picture diverges more dramatically for mobile vs. desktop here than anywhere else. We can see just how clearly Google is succeeding at solving searchers’ queries in the SERP, before any click takes place. Desktop is almost surprisingly stable, causing me to wonder whether that’s due to Google’s less active investments in the desktop results interface or because desktop searchers just like to click and research (I know I do). 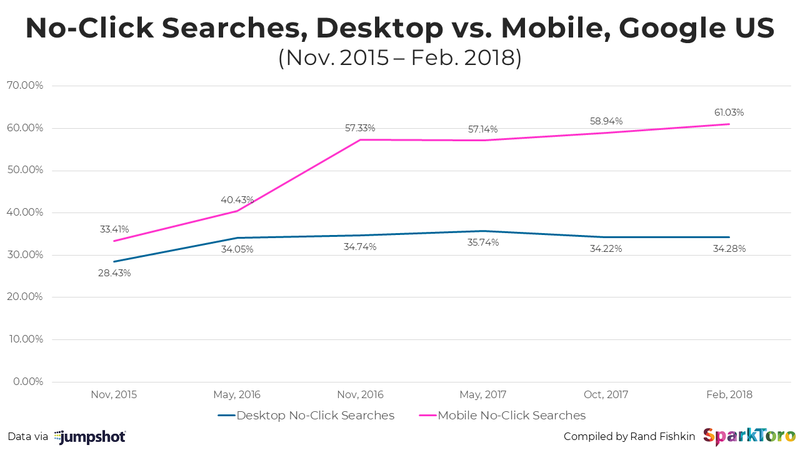 The continued slope increase on mobile is remarkable — it shows that Google is having simultaneous success earning more paid clicks on mobile AND still solving more mobile queries without a click. Only organic is losing out on smartphones. Ultimately, I think this data shows us that the future of SEO will have to account for influencing searchers without earning a click, or even knowing that a search happened. That’s going to be very frustrating for a lot of organizations. But for a smart few who recognize this power, invest in “On-the-SERP-SEO,” and can deal with the lack of metrics accountability, there will be vast dividends to reap. If you’d like to use these numbers or charts for any public materials, you’ve got full permission to do so as long as there’s link attribution. A huge thanks to the Jumpshot team, especially Shaun Rivera, Saniya Jesupaul, and Deren Baker, for their support and hard work. p.s. Jumpshot’s data has wide coverage, but does not include iOS devices, and excludes voice answers (though it will include voice searches that produce a browser screen of results on Android or PC). Originally published at sparktoro.com on April 23, 2018.